Place potatoes in large saucepan. Cover with water and boil until tender, about 15 minutes. In a small bowl, combine sour cream and mayonnaise until smooth. Stir in blue cheese crumbles. 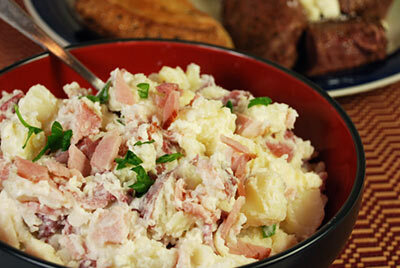 Drain potatoes; gently stir in blue cheese mixture; sprinkle with bacon and parsley and serve hot.